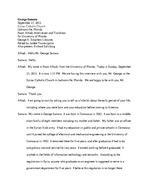 George Samara September 23, 2012 Syriac Catholic Church Jacksonville, Florida Esam Alhadi, Interviewer and Translator for University of Florida George A. Smathers Libraries Edited by Jardee Transcription Also present, Richard Saltzburg Alhadi: Hello Mr. George Samara. Samara: Hello. Alhadi: My name is Esam Alhadi, from the Univ ersity of Florida. Today is Sunday, September 23, 2012. It is now 1:33 PM. We are having th is interview with you, Mr. George, at the Syriac Catholic Church in J acksonville, Florida. We are happy to be with you, Mr. George. Samara: Thank you. Alhadi: I am going to start by asking you to tell us a little bit about the early period of your life, including where you were born and your e ducation before coming to America. Samara: My name is George Samara. I was born in Damascus in 1963. I was born to a middleclass family of eight members including my mo ther and father. My father was an officer in the Syrian Arab army. I had my educati on in public and private schools in Damascus until I joined the college of electrical and m echanical engineering at the University of Damascus in 1982. I remained there for five years, and after graduation I had to do compulsory national service for two y ears. I started working before I graduated. I worked in the fields of information te chnology and networks. According to the regulations in Syria, anyone who graduates as an engineer is supposed to serve in a government department for five years. I be lieve this regulation is no longer there. Alhadi: Is this separate from the compulsory military service? Samara: The two years military service is part of this five-year period. In my case, I had the opportunity to work for the ministry of hea lth. I helped them in establishing a new information department. This was at a tim e when the field of using computers and database applications was still in its early days in Syria. This department is still functioning. I was on the first team that starte d this work. I worked there for four years on a number of projects, such as transforming hospitals to work on the automated system. I left the ministry of health and started my private business because the income that I was making from my work for the government was not encouraging for me to continue. I opened a private office for computer learni ng and another one for computer services, database, networking, and hardware maintenan ce. These fields were not widely known in Syria at the time. I attempted to provide all computer-related wo rk. I continued doing this work for nine years until I made the de cision to leave Syria in search of medical treatment for my wife, who was very sick at the time. We came to America so she could start her treatment here. The intention was to stay here only tempor arily. However, we later found that the treatment requires more tim e, and for that reason we decided to stay here permanently. Alhadi: Why did you pick Jacksonville to be your home town? Samara: My wife had some close relatives and family members residing in this city. As you know, everyone who comes to America for the firs t time will need to have some help and support until he finally settles and gets to know more about the area and the system here. Alhadi: I would like to hear mo re about the period when you were trying to get settled here in America. Samara: I became a legal resident in 2001, based on my wifes legal resident status that she had from before. Soon after that, I was offe red a manager position in a communication company called Oriental Co mputers and Technology. It was a new company. The company was owned by an in-law of mine. His name is Wajeeh. In 2005, Wajeeh decided to give up his ownership of that company because he had another government position in the city of Jacksonville. I took over the company and it became my own business. I have worked there ever since. Alhadi: Would you please give us more details as to what nature of work this company does? Samara: At the beginning, we were worki ng in the wholesale business of cell phones and prepaid cards. We worked in computer mainte nance in addition to offering IT training in different types of software. After 2005, we sh ifted our business from physical delivery to electronic delivery. This shift made it possible for our customers to go through the system to retrieve or print any card they want. Alhadi: Are you currently the person who is in charge? Samara: I am in charge, and I am the owner of the company. Alhadi: Who is helping you with the work? Samara: Because of the deteriorating economic conditions that we have been going through during the past five or six years, we decided that we dont need a large number of employees. The numbers kept fluctuating between a high of si x to a low of one, depending on market conditions. It also depends on finding pe ople with the right skills that we can train and trus t to do the work correctly. Alhadi: Do any of your direct family me mbers have anything to do with the work? Samara: Not at all. I am by myself. person follows the rules and doesnt break a ny regulation. I have heard of issues like these with other people, but I person ally had no problem of this nature. Alhadi: How do you see your business at this level and in this time? Samara: This kind of business re quires continuous development. Y ou need to keep up with the technology and to acquire new materials that match fast technologica l developments. We are now getting into a big project that will cover all of the USA and Canada. Alhadi: Can you tell us a little bit about this project? Samara: We intend to introduce a new system calle d IPTV. This is similar to the system used by AT&T and called U-verse. We plan to in troduce it to the Arab immigrant community. IPTV is a small computer that has a pro cessor and memory and you connect it to the Internet. It doesnt ne ed a dish outside the house. It re ceives signals through the Internet. It will be as clear as other mediums such as phone or regular TV. This technology exists here in America and we need to keep up with it to remain competitive in the field of communications. Alhadi: You mentioned that this service is intended for the Arab community. What do you mean? Samara: The stations that will broadcast through this system are Arab stations. Alhadi: You are referring to radio and TV stations? Samara: We have signed a partnership contract with a European company to provide Arabic stations because these are very limited here in America. We are thus forced to get Arabic stations from outside America and add them to our Internet data cen ter and server. The IPTV will be connected to this data center and will thus receiv e stations that are available to hundreds of thousands across the globe. Alhadi: Is this service currently available? Samara: We are ready to get the system running. It will be ready for marketing in the USA within one month. Alhadi: How does it work? Is it like the cable sy stem where customers have to make a monthly payment or does it work through a receiver th at customers have to buy and install? Samara: Customers have to buy a receiver. Howe ver, the American government rules in this area are still vague. There are different regula tions in many fields that we are connected tosuch as the Internet and broadcasting. Broadcasting works through satellites. This doesnt apply to our case. The fact is that there are no clear-cut rule s that would make us determine the subscription rates because these have to include fees that go to the government as tax. Alhadi: This sounds like a big project. Samara: Our system has many characteristics th at other similar systems dont have. We are trying to make it parallel to the U-verse syst em in terms of the technology that is used. We are also trying to make our technology more advanced than the one used by other companies who use similar receivers. Alhadi: Let us move on to talk about business connections. Do you currently have any business connections with Syria or any other Arab country? Samara: My connections in Syria are friendships in nature. It is known th at there is no official business relations between Syria and the USA because of the embargo imposed on Syria. This makes it difficult to have business connectio ns. If it were not for this embargo, there are wide areas for business opportunities. This is one of the difficulties we are facing. Alhadi: How about other Arab countries? Samara: I have no business connections with Arab countries. All my connections were in Syria because that is where I grew up and that is where I had business connections when I was there. I havent tried to es tablish any business connections with other Arab countries because it may be risky. If you have busine ss here, it must be designed to make money right away. This is what stops me from taking chances in my business. Alhadi: How about business connections with local American companies? What companies have you established business connections with? Samara: We deal with three medium-size companie s. We are their agent here in Florida and we take care of their business here. Alhadi: Do you mind telling us what these companies are? Samara: One of them is called Black Stone and is based in Miami in South Florida. The other one is called PreWay from Alabama. The third one is called T Extra from Columbus Ohio. We are also dealing with many othe r companies. Our connections with them might be limited at times and very large at ot her times. It depends on the market which is always changing. We try to keep our connec tions with all companie s alive at all times even though we are not conducting business with them. Business opportunities may come up at any moment. These business conne ctions helped me to establish friendly relations with the people who are running these companies. Alhadi: I know that most members of the Ar ab communities here in America who chose to go into the business field, they all do either a gro cery store, restaurant, convenience store, or a gas station. What strikes me about your bus iness in the field of communication is that it is way different from what Arabs usually do.